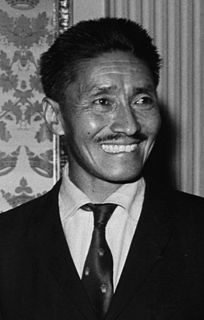 Tenzing Norgay, born Namgyal Wangdi and often referred to as Sherpa Tenzing, was a Nepali-Indian Sherpa mountaineer. He was one of the first two individuals known to reach the summit of Mount Everest, which he accomplished with Edmund Hillary on 29 May 1953. Time named him one of the 100 most influential people of the 20th century. Jamling Tenzing Norgay is a Nepali Sherpa mountain climber. 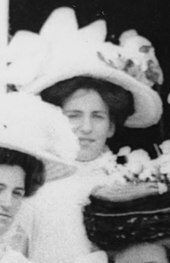 George Christopher Band was an English mountaineer. 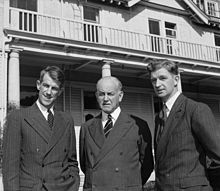 He was the youngest climber on the 1953 British expedition to Mount Everest on which Edmund Hillary and Tenzing Norgay made the first ascent of the mountain. Mera Peak is a mountain in the Mahalangur section, Barun sub-section of the Himalaya and administratively in Nepal's Sagarmatha Zone, Solukhumbu District. 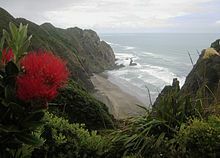 At 6,476 metres (21,247 ft) it is classified as a trekking peak. It contains three main summits: Mera North, 6,476 metres (21,247 ft); Mera Central, 6,461 metres (21,198 ft); and Mera South, 6,065 metres (19,898 ft), as well as a smaller "trekking summit", visible as a distinct summit from the south but not marked on most maps of the region. 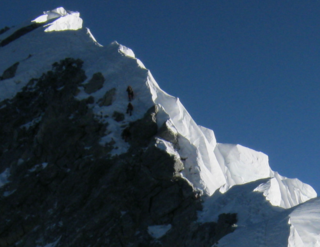 The Hillary Step is, or possibly was, a nearly vertical rock face with a height of around 12 metres (39 ft) located very high on Mount Everest at approximately 8,790 metres (28,839 ft) above sea level, near the summit. It is located on the southeast ridge, halfway between the "South Summit" and the true summit, and is the last real challenge before reaching the top of the mountain via the southeast route. The Step is named after Sir Edmund Hillary, who was the first known person, along with Tenzing Norgay, to scale it on the way to the summit. Apa, nicknamed "Super Sherpa", is a Nepalese Sherpa mountaineer who, jointly with Phurba Tashionce held the record for reaching the summit of Mount Everest more times than any other person. As part of The Eco Everest Expedition 2011, Apa made his 21st Mount Everest summit in May 2011 then retired after a promise to his wife to stop climbing after 22 ascents. He first summited Everest in 1990 and his last time to the summit was in 2011. 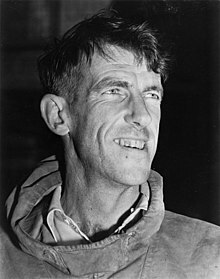 Peter Edmund Hillary is a New Zealand mountaineer, philanthropist and writer. 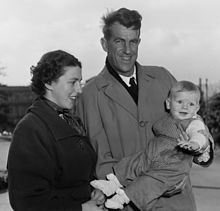 He is the son of adventurer Sir Edmund Hillary, who, along with Nepalese Sherpa mountaineer Tenzing Norgay, completed the first successful ascent of Mount Everest. When Peter Hillary summited Everest in 1990, he and his father were the first father/son duo to achieve the feat. Hillary has achieved two summits of Everest, an 84-day trek across Antarctica to the South Pole, and an expedition guiding astronaut Neil Armstrong to land a small aircraft at the North Pole. He has climbed many of the world's major peaks, and on 19 June 2008, completed the Seven Summits, reaching the top of the highest mountains on all seven continents, when he summited Denali in Alaska. 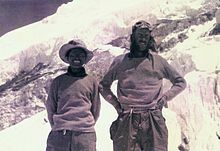 Led by Edouard Wyss-Dunant, the 1952 Swiss Mount Everest expedition saw Raymond Lambert and Sherpa Tenzing Norgay reach a height of about 8,595 metres (28,199 ft) on the southeast ridge, setting a new climbing altitude record, opening up a new route to Mount Everest and paving the way for further successes by other expeditions. Hillary Peak is the name which has been proposed by the Government of Nepal for a 7,681 metres (25,200 ft) peak in the Himalayas in honour of Edmund Hillary, who made the first ascent of Everest with Tenzing Norgay in 1953. 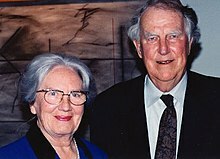 The Sir Edmund Hillary Mountain Legacy Medal is awarded every one or two years to an individual "for remarkable service in the conservation of culture and nature in mountainous regions." 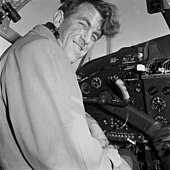 The medal both recognizes the service of Sir Edmund Hillary on behalf of mountain people and their environment and also encourages the continuing emulation of his example. The Hillary Medal is a project of Mountain Legacy, a Nepalese non-governmental organization ; the president is biologist Kumar P. Mainali. 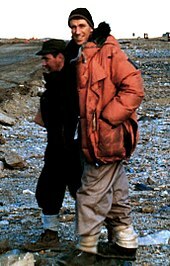 The Hillary Medal was personally authorized by Sir Edmund in 2002, and ratified by the Namche Consensus, the declaration resulting from the 2003 Namche Conference: "People, Park, and Mountain Ecotourism." 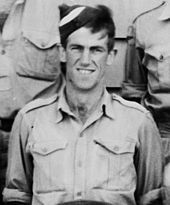 Norman David Hardie was a New Zealand climber who was involved in the first ascent of 8,586-metre (28,169 ft) Kangchenjunga, the third-highest mountain in the world.